View More In Folding Hunting Knives - Page 4. Jeslon® that Work on Household Product. These products including: Ceramic knife Set,Stainless Steel Knife,Knife Sharpener,Household Appliances,Household Accessories and so on. We provide High quality product and best service for you. Our Conception: Buy what you need, Do our best. 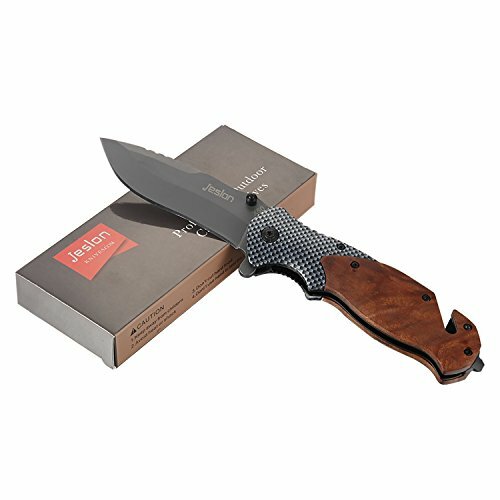 Jeslon assisted opening gentleman's folding knife features 3.3 inches, 2.8 millimeter thick gray stainless steel blade with a straight edge blade and a 4.7 inches closed length. Offering easy one-handed deployment, this spring assisted open folding knife locks securely into place with the use of its liner lock. Offering a simple yet classic design, the handsome brown wood overlay handle adds a beautiful element of nature to this gentleman's styled pocket knife. It also has a pocket clip for easy and safe carry. Spring assist folding knife offers rapid one-handed deployment, locks securely into place with liner lock. Excellent practicality recommended for outdoor. It is one of the big success in field work such as mountain walking and camping / cooking / DIY. Handsome wood+carbon fiber handle inlay . Blade material: 440C stainless steel, Weight: (including packaging) 150 grams, length of blade: 205 mm, blade length: 85 mm, handle length: 120 mm, blade width: 28 mm, blade thickness: 2.8 mm, Hardness: 57 HRC, Surface: Gray Titanium, Handle Material: Steel Handle + Imitation Carbon Fiber of Shadow Trees, Lock Type: Quick Opening. If you have any questions about this product by Jeslon, contact us by completing and submitting the form below. If you are looking for a specif part number, please include it with your message. Pocket Knife 6.5'' Buffalo Horn Damascus Steel Knife Brass Bloster Back Lock Folding Knife + Real Horn Handel Knife + Sharpening Rod Pocket Knives 100% Prime Quality+ Camel Bone Small Pocket Knife.